The Irish journalist says he’s been devastated by the news. Paul Kimmage: funds were raised for legal battle. 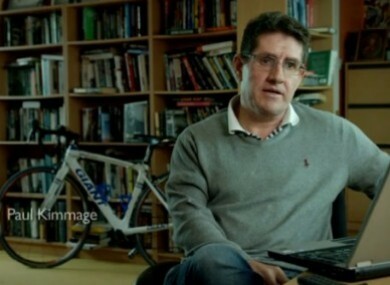 PAUL KIMMAGE ADMITS he was plunged into a ‘black hole’ this week when he learned that thousands of dollars of his legal defence fund are now seemingly unavailable to him. The money was donated by cycling fans around the globe to help the Irish journalist, when he was faced with a defamation case against UCI chief Pat McQuaid. Questions were raised about the fund in recent days however as it emerged that up to $65,000 had allegedly been moved from a PayPal account by a fund administrator. “It’s been, in a word… devastating is a very strong word but I’ve spent the past few days in a black hole,” the award-winning writer told Matt Cooper on Today FM’s The Last Word this evening. Having lost his job at the Sunday Times, Kimmage admits he was left vulnerable in the face of the battle with former friend and now world cycling boss McQuaid. But when almost $100,000 was raised by supporters throughout the world, he vowed to fight the case. Last weekend, Kimmage admitted on RTÉ radio that last year had been the toughest of his life. Then he got more bad news when he left Montrose. “I walked out of the studio with Marian Finucane on Saturday and there an email on my phone from Lesli Cohen who was one of the people who was responsible for setting up the fund for me,” Kimmage said on Today FM earlier. “She said she she had some serious concerns about where the money was. And that if she didn’t get to the bottom of that she would be issuing a statement disassociating herself from the fund. So I called her when I got home; I asked her what her concerns were and she directed me to Aaron Brown, who was a partner with her in Cyclismas. That was one of two websites that set the fund up initially and they essentially took over the running of the fund. So she directed me to Aaron Brown, who had been in my house a week earlier. “And I called Aaron and my first question to him was: Have you been using this money for your business. And he said no. So I said fine, okay, we need to get to the bottom of this. I need a statement showing me all the details of where the money has gone etc, etc… and he said grand. And this was late Saturday and by Monday I still hadn’t got the statement. Email “Paul Kimmage in a 'black hole' as questions raised about missing defence fund money”. Feedback on “Paul Kimmage in a 'black hole' as questions raised about missing defence fund money”.